Abby from Things for Boys guest blogs at Emmaline Bags with a post showing the postage stamp bag she made for a good friend. At first glance, it looks like she found some awesome fabric printed with postage stamp images. But read her post and you’ll find out that she used actual postage stamps and Mod Podge to create that fabric. 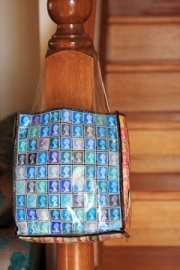 Go there now to read about the postage stamp fabric and see more photos of the bag.